For many of American television's early years rural comedies were absent from the airwaves. The situation comedies of the era generally took place in major cities or suburbs of major cities. Quite simply, network executives were convinced that American television viewers were not interested in shows about rural people. All of this changed in 1957 with the debut of The Real Mccoys, a sitcom about a West Virginia hillbilly family who moved to a farm in California. The Real McCoys proved to be a hit, ranking in the top twenty for much of its run. The success of The Real McCoys proved that there was a market for rural comedies. Despite the success of The Real McCoys, the American broadcast networks did not rush to make more rural comedies right away. It was not until The Real McCoys' fourth season (the 1960-1961 season) that three more rural comedies joined it on network schedules. One of those would become one of the most successful shows of all time in any genre. The first of the three rural comedies to debut in the 1960-1961 season is now largely forgotten. In many respects Guestward Ho! could be considered The Real McCoys in reverse. Guestward Ho! centred on Bill Hooten, a New York City advertising executive who had tired of life in the big city and as a result moved his family to a dude ranch in New Mexico (the "Guestward Ho" of the title). The series was based on the 1956 book Guestward Ho by Patrick Dennis (perhaps best known for his novel Auntie Mame: An Irreverent Escapade) and Barbara C. Hooten, which in turn was based on the real life experiences of Mrs. Hooten and her husband Bill Hooten in running a dude ranch in New Mexico. Guestward Ho! would not take an easy path from the printed page to the television screen. In the 16 January 1957 issue of The New York Times it was announced that CBS had bought the rights to the book. Later in the year, in the 24 December 1957 issue of The New York Times, it was reported that CBS was producing a pilot for Guestward Ho!, starring Jeanne Crain. The 3 February 1958 issue of Billboard listed Guestward Ho!, starring Jeanne Crain, as among the pilots for that coming fall season. In the end CBS dropped its option for Guestward Ho and it never emerged as a series starring Jeanne Crain. The rights for Guestward Ho! were then bought by Desi Arnaz as a vehicle for Vivian Vance, then as now best known as Ethel Mertz on I Love Lucy. In a UPI article published 14 October 1959 Vivian Vance is quoted in an interview as saying, "Right now I'm hoping to star in my own series. The pilot already has been filmed. It's the story of a couple who open a dude ranch in New Mexico. We've titled it Guestward Ho with Leif Erickson co-starring." Unfortunately, after so many years playing Lucille Ball's sidekick on I Love Lucy Vivian Vance proved ill suited as a series lead. ABC rejected the pilot and a new pilot was made, with Joanne Dru and Mark Miller as Babs and Bill Wooten. At long last Guestward Ho! became a TV series, debuting on 29 September 1960. In many respects Guestward Ho! could be considered a forerunner of the later rural comedy Green Acres. Advertising executive Bill Hooten bought the dude ranch Guestward Ho without consulting his wife, who was not particularly eager to move to New Mexico. She agreed to try it out for a year, so the Hootens and their son Brook (played by Flip Mark) moved out west. Added to the mix was a rather capitalistic Native American named Hawkeye (played by J. Carroll Naish), who ran the local trading post. Like Green Acres after it, much of the humour on Guestward Ho! stemmed from the fact that the Hootens were fish out of water. Unfortunately, for all the effort that it took to bring a show based on the book Guestward Ho to television, the series Guestward Ho! did not last long. It was cancelled after a single season. The second rural comedy to debut in the 1960-1961 season would prove to be one of the most successful shows of all time. In fact, when its syndication run is figured in, it might well be the most successful sitcom of all time, short of I Love Lucy. The Andy Griffith Show debuted on CBS on 3 October 1960 and has been on television screens ever since. The genesis for The Andy Griffith Show originated with Sheldon Leonard. Mr. Leonard had a long career playing character roles in films stretching back to the Thirties, with his most famous role being that of Nick in It's a Wonderful Life. In the Fifties he became a television producer, producing the classic show Make Room for Daddy (also known as The Danny Thomas Show). Sheldon Leonard had an idea for a show centred on a fellow who was the newspaper editor, sheriff, and justice of the peace in a small town. He asked one of the writers for Make Room for Daddy, Arthur Stander, to write an episode that would also serve as a backdoor pilot for the prospective series. It was the William Morris Agency who put Mr. Leonard in touch with Andy Griffith, who was interested in starring in a TV series. Andy Griffith had already had a very successful career, In 1954 he had a hit comedy record with the monologue "What It Was, Was Football". In 1955 he starred in The United States Steel Hour's adaptation of the novel No Time for Sergeants. Afterwards he starred in a Broadway adaptation of the teleplay and then the film adaptation released in 1958. He also starred in the 1957 film Face in the Crowd (arguably his best performance) and the 1957 Broadway musical version of Destry Rides Again. The backdoor pilot to The Andy Griffith Show, titled "Danny Meets Andy Griffith" aired as an episode of Make Room for Daddy on 15 February 1960. The pilot proved to be a success. As the sponsor of Make Room for Daddy, General Foods had first access to The Andy Griffith Show and decided to sign on as its sponsor immediately. Here it should be pointed out that the pilot, "Danny Meets Andy Griffith", would differ in some respects from The Andy Griffith Show with which viewers are familiar. Of The Andy Griffith Show cast only Andy Griffith as Sheriff Andy Taylor and Ron Howard as his son Opie appear. While Frances Bavier does appear, it is as one of Mayberry's widows rather than Aunt Bee. As in the original concept for the show, in the pilot Andy Taylor is the town's newspaper editor as well as sheriff and justice of the peace. In The Andy Griffith Show Andy was only Mayberry's sheriff and justice of the peace, not its newspaper editor as well. The idea of a drunk who locks himself in jail when he has had a few too many originated with the pilot, but instead of Otis Campbell (played by Hal Smith) the town drunk was Will (played by Frank Cady, now best known as Sam Drucker on Petticoat Junction and Green Acres). Perhaps the most noticeable difference between "Danny Meets Andy Griffith" is the absence of Andy's deputy, Barney Fife. Don Knotts had become friends with Andy Griffith when the two of them appeared in the Broadway production of No Time for Sergeants. They later worked together in the film version. When Andy Griffith told Don Knotts about his upcoming television show, it was Mr. Knotts who suggested to Mr. Griffith that Andy would need a deputy. At the time Don Knotts may have been best known as the highstrung, nervous Mr. Morrison in the "man on the street" interviews on The Steve Allen Show. It was the character of Mr. Morrison who provided the basis for Andy's highstrung, nervous, and self important deputy Barney Fife. Over the course of the show Barney would easily become its most popular character. Originally the character of Sheriff Andy Taylor was portrayed somewhat broadly as a country bumpkin not unlike the church deacon of "What It Was, Was Football" or Will Stockdale of No Time for Sergeants. It was during the first season that it was decided that instead Andy should be the straight man to the many outrageous characters around Mayberry (particularly Deputy Barney Fife). As a result the show began to focus much more on the citizens of Mayberry than it had in its early episodes. Of course, as a result The Andy Griffith Show became a very character driven comedy. While it was not nearly as broad as many of the rural comedies that would follow it (such as The Beverly Hillbillies and Green Acres), it differed a good deal from the gentler domestic comedies of the Fifties, such as The Adventures of Ozzie and Harriet and Father Knows Best. In many respects its brand of humour resembled that of its parent show, Make Room for Daddy. The characters (Barney Fife, Floyd the Barber, and Otis Campbell being prime examples) were often very exaggerated, but for the most part situations were kept to a realistic level. 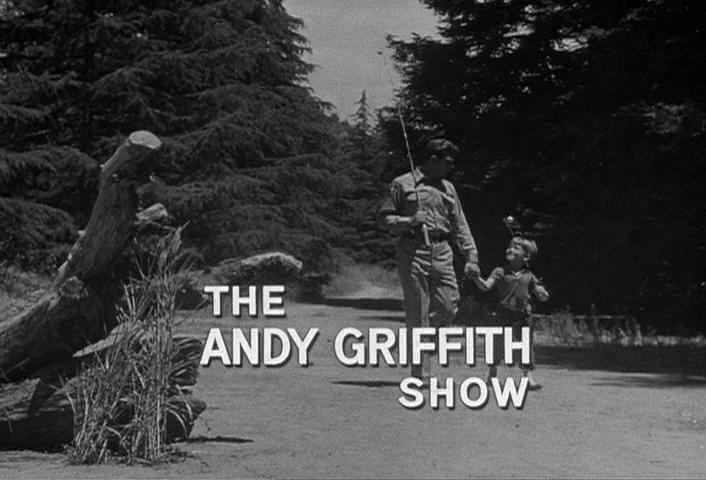 The Andy Grifffith Show debuted on 3 October 1960 and proved to be one of the biggest hits of the season. In its very first season it ranked #4 out of all the shows on the air for the year according to the Nielsen ratings. What is more, during its entire eight year run, the lowest that it ever ranked was #7 for the year in its second season. The Andy Griffith Show was still a success in 1967 when Andy Griffith decided he wanted to pursue a career in film. In fact, for its final season it was the #1 show on the air, a feat only accomplished by two other shows: I Love Lucy and Seinfeld. Of course, in some ways it is difficult to say The Andy Griffith Show ended so much as it simply continued without Andy Griffith. On 23 September 1968 Mayberry R.F.D. debuted, continuing the adventures of the citizens of Mayberry. Since The Andy Griffith Show left CBS in 1968 it has continued to air in syndication to this day. In addition to many local stations, it currently airs on both TV Land and ME-TV. While the success of The Real Mccoys paved the way for rural comedies, it was the success of The Andy Griffith Show that truly kickstarted the cycle towards them in the Sixties. Following the debut of The Andy Griffith Show, there would be at least one rural comedy that debuted each season until 1969 with the exception of the 1966-1967 season. Like The Andy Griffith Show, the third rural comedy to debut during the 1960-1961 season would also be a groundbreaking show. Indeed, not only was it a rural comedy, but it was the first show in another cycle that dominated the Sixties, one towards fantasy sitcoms. That show was Mister Ed, which centred on Wilbur Post (Alan Young) and his most unusual horse, Mister Ed (played by the palomino Bamboo Harvester and voiced by Rocky Lane). Mister Ed could talk, but would only do so in person to Wilbur. Worse yet, Mister Ed had a mind of his own and a tendency to get into mischief. 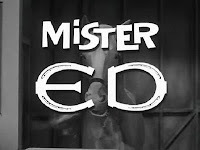 Given the show centred on a talking horse, Mister Ed is considered by many as a precursor to the many other fantasy sitcoms of the Sixties, such as My Favourite Martian, Bewitched, and The Addams Family. Beyond being the first fantasy sitcom of the Sixties, Mister Ed was also one of the first shows to debut with James Aubrey as the president of CBS. As such it was also one of the first shows on CBS to exemplify Mr. Aubrey's programming formula of purely escapist entertainment. Mister Ed then paved the way for other escapist television shows that aired on the network during James Aubrey's tenure as president, shows that included The Beverly Hillbillies, Gilligan's Island, and Petticoat Junction. Perhaps because it was meant as purely escapist entertainment and because of its fantastic premise, Mister Ed also marked a shift away from the more gentle humour of the domestic comedies of the Fifties to the broader comedy of the situation comedies of the Sixties. The plots of Mister Ed were closer in spirit to the outrageous, hair brained schemes on I Love Lucy earlier in the decade than they were the morality plays of Father Knows Best later in the decade. Among all of these things, however, Mister Ed can also be considered a rural comedy. Indeed, an article in the 10 September 1961 issue of the St. Petersburg Times ("Mister Ed Returns Oct. 1) describes Wilbur and his wife living in "...a representative semi-rural suburban community." The original "Mister Ed" stories were set in an actual small town, Mount Kisco,New York, which as of the 2010 census only has a population of 10,877 people. The television show appears to have been set in a similarly sized community, although located in California (most likely near Los Angeles). While not as large as a farm or ranch, the Posts' home apparently sat on a lot of some acreage. Indeed, their land not only included the house, but the stable in which Mister Ed lived as well. Although Mister Ed was not as rural as such shows as The Andy Griffith Show (according to a sign in the 8th season Mayberry only had 5,360 people) or Petticoat Junction (according to one episode Hooterville's population is only 48, although it seems larger), it was a far cry from such earlier shows of the Fifties as I Love Lucy (set in New York City) or even Leave It to Beaver (set in the decidedly suburban Mayfield). Mister Ed was based on the short stories of Walter R. Brooks. Mr. Brooks wrote some twenty eight stories about Mister Ed, published in Liberty and The Saturday Evening Post in the Thirties and Forties. It was director and producer Arthur Lubin (who made the similar "Frances the Talking Mule" films in the Fifties) who thought that Mr. Brooks' stories could provide the basis for a television series. He bought the rights to the stories in 1957 and spent the next several years shopping his idea for a Mister Ed TV series around. Eventually Mister Ed would find a home with Filmways, the production company that would be responsible for many of the rural comedies of the Sixties. Mister Ed debuted in syndication on 5 January 1961. The show did well enough that it was picked up by CBS, who announced on 22 June 1961 that the show was moving to the network effective with the fall season. While Mister Ed was never a ratings smash (it never ranked in the top 30 shows for the year), it did moderately well and lasted for six seasons. Following the end of its run it entered syndication where it has remained ever since. The 1960-1961 television season would prove to be a pivotal year for rural comedies. While the success of The Real McCoys in the 1957-1958 proved that rural comedies were viable on American television, it was arguably the phenomenal success of The Andy Griffith Show that started the cycle towards the genre in the Sixties. Following the debut of The Andy Griffith Show, at least one rural comedy would debut each season until 1969. During many seasons in the Sixties more than one rural comedy would debut. It would seem that the network executives who had dismissed rural comedies in the years before the debut of The Real McCoys were wrong.